Scientists around Tetyana Milojevic from the Faculty of Chemistry at the University of Vienna are in search of unique biosignatures, which are left on synthetic extraterrestrial minerals by microbial activity. The biochemist and astrobiologist investigates these signatures at her own miniaturized “Mars farm” where she can observe interactions between the archaeon Metallosphaera sedula and Mars-like rocks. These microbes are capable of oxidizing and integrating metals into their metabolism. The original research was currently published in the journal Frontiers in Microbiology. 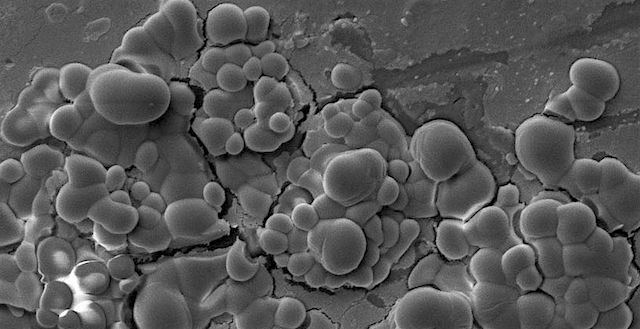 To satisfy microbial nutritional fitness, the research team uses mineral mixtures that mimic the Martian regolith composition from different locations and historical periods of Mars: “JSC 1A” is mainly composed of palagonite – a rock that was created by lava; “P-MRS” is rich in hydrated phyllosilicates; the sulfate containing “S-MRS”, emerging from acidic times on Mars and the highly porous “MRS07/52″ that consists of silicate and iron compounds and simulates sediments of the Martian surface. This entry was posted in Reports and tagged biosignatures, hydrated minerals, hydrated sulfates, life, Metallosphaera sedula, microorganisms, palagonite, phyllosilicates, regolith. Bookmark the permalink.